VietNamNet Bridge – The emerging mass tourism in coastal provinces in recent years has destroyed natural beauty spots at a furious pace. And in the next five years, Vietnam may lose all tourism resources. The stark warning came from Vu The Binh, deputy head of Viet Nam Tourism Association speaking at a recent conference. Cua Dai Beach in Hoi An Town, the central province of Quang Nam, for example, has gradually lost its attraction to Western tourists due to salt intrusion. Many now choose An Bang Beach or Ha My Beach instead, but that beach is also showing signs of subsidence. Cua Dai Beach erosion is caused by the lack of mud and soil running from the upstream. Professor Nguyen Kim Dan told Tiền Phong (Vanguard) newspaper that the construction of hydropower plant dams and illegal sand mining on Thu Bon River, the mother river of Quang Nam Province, also contributes to the shortage of mud. Too many resorts built on the shore block the supply of sand to the beach, making Cua Dai gradually disappear. Mui Ne Beach in the southern central province of Ninh Thuan, once featured in top ten beautiful beaches in Asia-Pacific, is now facing similar problems. From fully booked years ago, “the resort land” of Mui Ne has seen a decline in the number of visitors. On most popular booking sites like, Agoda or Tripadvisor, many travelers have left negative feedbacks for the beach saying it has lost its original charm. At present, according to Binh, only two southern central provinces of Ninh Thuan and Phu Yen still have tourism resources. “These provinces should take time and not rush to invest into beach tourism. As a follower, Ninh Thuan Province needs to be aware of other localities’ failures and be careful in planning and choosing investors,” he said. Right after Bsi Kem in Phu Quoc Island was named in top 100 most beautiful beaches in the world by the Canada-based Flight Network and the island aimed to become Vietnam’s special economic zone, local beaches have started being divided into areas to build tourism spots. However, many of these constructions are illegal. Earlier this year, Phu Quoc Island Urban Security Surveillance Team found 650 cases of violating regulations of construction. According to Viet Nam Association of Realtors, in the first three months of 2018, the price for one sq.m of land on Phu Quoc Island’s central street of Tran Hung Dao rose almost threefold, set at VND100 million (US$4,300). Nguyen Tan Phong, deputy director of Phu Quoc District Land Registration Office, said they received 1,000 dossiers asking for acquiring land use right certificates each month. Binh Chau Commune in Xuyen Moc District, Ba Ria-Vung Tau Province, which has been long considered as the “green lung” of the southeast region is now being targeted by investors. The land price has been rising dramatically from VND400-500 million ($17,200-21,500) for 100sq.m to VND600-700 million ($25,800-30,100) in the past few months. Tran Van Nguyen, a Canadian-Vietnamese investor, said it was easy to earn huge profits after a short period of time by investing into real estate projects in Vietnam’s new tourism spots. Beautiful landscapes, convenient services and flocks of visitors have become a common formula of Vietnam tourism for years. Onl until many natural landscapes started being destroyed, did people realise their impacts on environment and discuss sustainable tourism. 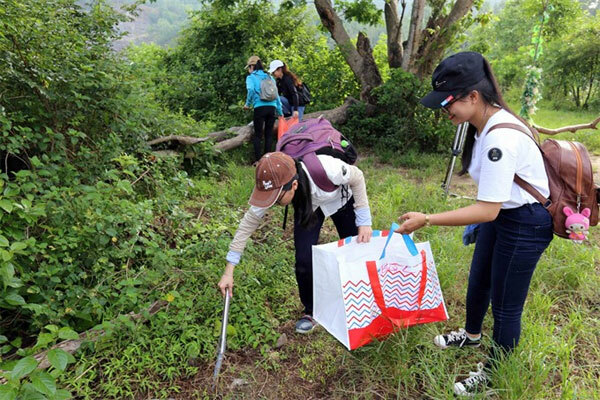 Dao Dang Cong Trung, 40, in the coastal city of Da Nang, who has picked up trash on Son Tra Peninsula, said mass tourism is affecting the local ecosystem. Some monkeys living in the peninsula have formed a habit of finding food in the trash tourists throw away and not in the forest anymore. He warned that without tighter management, Son Tra may become the second Cua Dai Beach in the near future, suffering the severe damage and never restoring its original beauty. “It is impossible to say the national tourism is developing when only referring to the number of tourists. Most of tourism agencies have not paid much attention in preserving and protecting the nature’s gifts. The doomed future for our tourism is foreseen if this situation is continued,” said Binh.